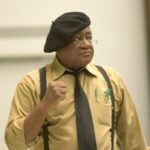 Robert Bobby Seale is an American political activist. He and fellow activist Huey P. Newton co-founded the Black Panther Party. "On the one hand, the guns were there to help capture the imagination of the people. But more important, since we knew that you couldn’t observe the police without guns, we took our guns with us to let the police know that we have an equalizer."